As the conflict in Syria extends into its 9th year, millions of children are in need of humanitarian support. 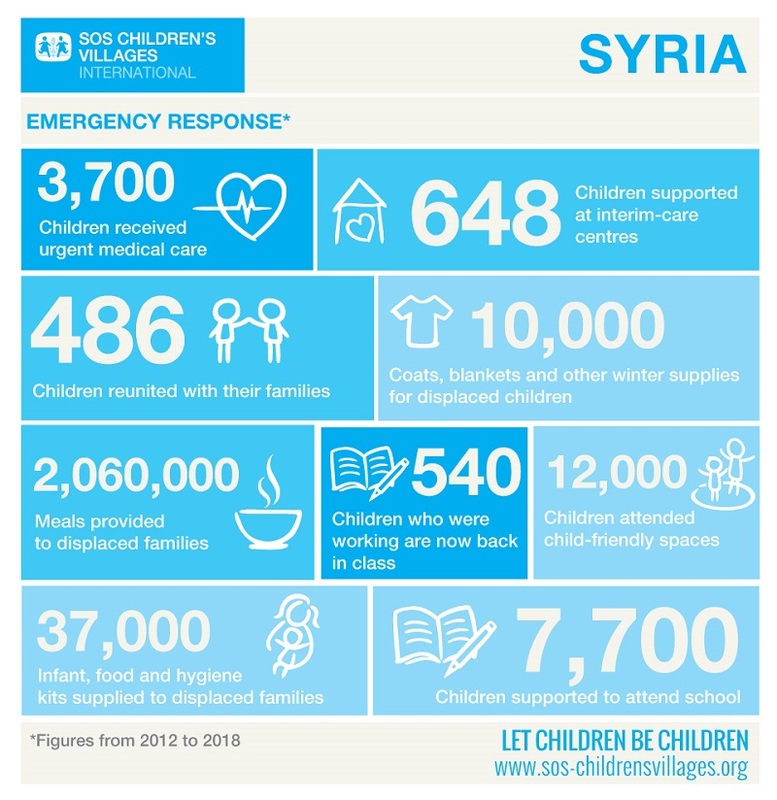 Whether it is providing a safe place to stay for children who have lost their homes and loved ones, or reuniting families, SOS continues to support the most vulnerable in Syria. Keeping families together is one of SOS’ top priorities, especially during humanitarian emergencies when children are particularly vulnerable. SOS Children’s Villages works to reunite families whenever possible so siblings and families can stay together. Meet Kareem* and Kamal, two of our success stories from Syria. Kareem* was just seven years old when he fled the city of Aleppo with his one-year-old brother Bader*. Their mother had died in the war and their father was unable to care for them properly. 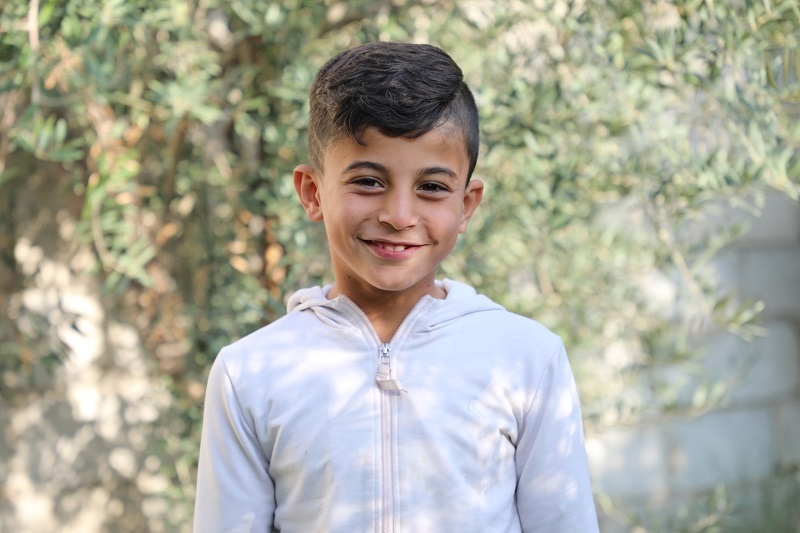 When the siblings reached Damascus, they became separated and Kareem found himself wandering the streets alone with no money and no one to go to. He was referred to the SOS Interim Care Centre in June 2017 so he could receive the protection and care he needed. At first Kareem remained silent and preferred to stay alone. But with the psychological support he received at the centre, he began to open up and tell his story. In talking to Kareem, Miss Zeina, the SOS psychologist, learned that he had an uncle living in Damascus. She then passed this information along to the SOS reunification strengthening project (RSP). A few months later, the RSP team was able to locate Kareem’s uncle. Additionally, they learned that Bader was already living with him. The uncle was ecstatic to find Kareem, but was afraid he would be unable to afford a second child in the family. 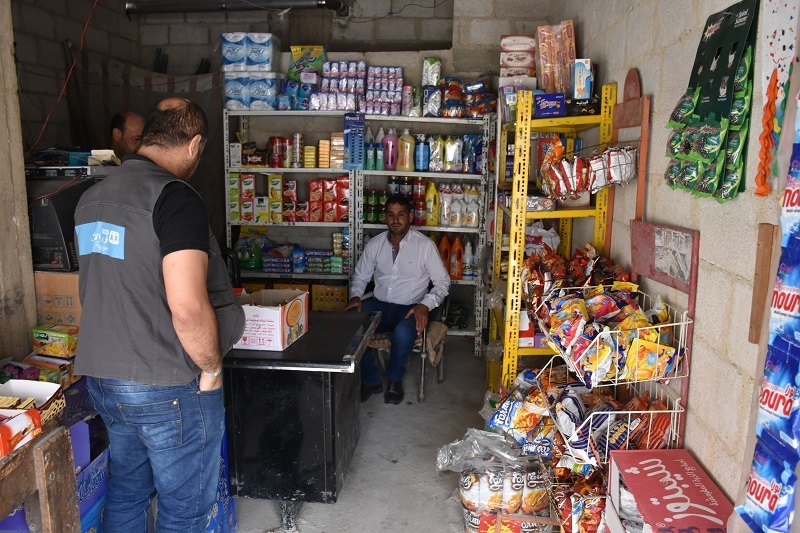 Believing that reunification would be best for Bader and Kareem, the RSP team helped the uncle open a grocery shop to support him financially. For the brothers, they were registered in school, and provided with school fees assistance, medical care, and emotional support. 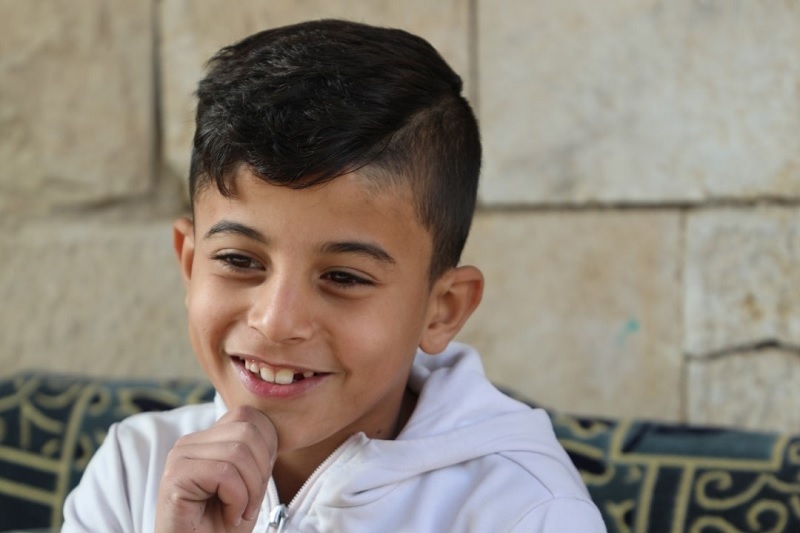 Today Kareem excels as a third grade student and continues to live with his uncle near Damascus. With this help of SOS he was given the chance to start over again. Kamal used to live with his wife and three children in Eastern Ghouta, on the outskirts of Damascus. One morning, he woke up to find his family in the middle of a war zone. Despite the precarious situation and their fear, Kamal and his children stayed at home as they had no other place to go. Three months later, a shell hit the roof of their home and their house collapsed. The children suffered only minor injuries and Kamal was unharmed. He took his children to the nearest first aid centre and ran to check on his small grocery shop. The store was in ruins, and Kamal now had no home and no place to work. The three children dropped out of school and, together with their father, traveled to Damascus. The family lived on the streets for weeks. Kamal was desperate to find work, but had no one he could leave his children with. “Our father’s last solution was to put us in an SOS Interim Care Centre (ICC). I know that his heart was broken to depart from us, but he knew it was the safest place in the meantime,” said Muna*, Kamal’s now ten-year-old daughter. Kamal left his children at the centre until he could find work and a place to stay. The children arrived at the centre traumatized and in a state of shock. The SOS team worked to help them through this challenging time. The children were placed in educational courses to make up for the schooling they had missed and enrolled in a school. They attended special emotional support sessions to help them with their post-traumatic stress disorder. The children were reunited with their father four months after arriving at the ICC. Kamal was covering his family’s needs working at a souk, a marketplace for groceries, earning a small income. He was enrolled in the RSP to help him reach financial independence and stability. “The SOS team worked to find a solution for Kamal and his children,” said Nazih Karraz, team leader of the SOS reunion strengthening program. “Our plan was to start supporting the family through the reunion strengthening program as quickly as possible, starting with a financial monthly allowance that includes heating, clothing, and school costs. Another important point was a rent allowance to secure that the children and their father are in a safe area in the city. We have also supported the children psychologically, which is achieved through regular visits by our specialists to supervise the children and monitor their well-being,” he added. To help Kamal and his family build towards a more sustainable future, the SOS RSP supplied him with the materials and information needed to open a food shop. Despite the difficult times the family has been through, Kamal is now able to meet his family’s needs and build his experience as a small business owner. “I cannot describe my feelings when I settled down with my children after SOS Children’s Villages helped us. I expected to see my children depressed after all we went through, but I was surprised and happy to find they were better, more mature, and emotionally stable. What is also important is all that SOS Children’s Villages did to help them in school,” said Kamal. SOS Children’s Villages opened its first village in Syria in 1981. After the war began in March 2011, the organization extended its support to war-affected families while also responding to the refugee emergency stemming from the war and other regional unrest. Our emergency programs are being transformed into long-term support for children who have lost parental care or are awaiting reunification with their loved ones.